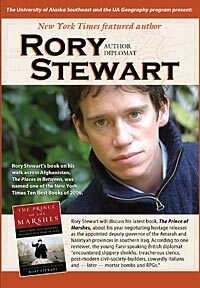 Saturday, March 1, 7 p.m.
Stewart’s book on his walk across Afghanistan, The Places in Between was named one of the New York Times Ten Best Books of 2006. Stewart will also be present for UAS Professor Robin Walz’s World History class on Friday, February 29, 2008 at the Egan Lecture Hall, 9:10-10:10 a.m. The public is welcome to attend. Bio: Rory Stewart was born in Hong Kong and grew up in Malaysia. He served briefly as an officer in the British Army (the Black Watch), studied history and philosophy at Balliol College, Oxford and then joined the British Diplomatic Service. He worked in the British Embassy in Indonesia and then, in the wake of the Kosovo campaign, as the British Representative in Montenegro. In 2000, at the age of 30, he took two years off and began walking from Turkey to Bangladesh. He covered 6000 miles on foot alone across Afghanistan, Pakistan, India and Nepal -- a journey described in The Places in Between. In 2003, he became the coalition Deputy Governor of Maysan and Dhi Qar -- two provinces in the Marsh Arab region of Southern Iraq. He has written for a range of publications including the New York Times Magazine, the London Review of Books, the Sunday Times, the Guardian, the Financial Times and Granta. In 2004, he was awarded the Order of the British Empire and became a Fellow of the Carr Centre at Harvard University. He now lives in Kabul, where he is the Chief Executive of the Turquoise Mountain Foundation, which is investing in the regeneration of the historic commercial centre of Kabul, providing basic services, saving historic buildings and constructing a new bazaar and galleries for traditional craft businesses.